Star Wars is famous for its iconic scores composed by the legendary John Williams. 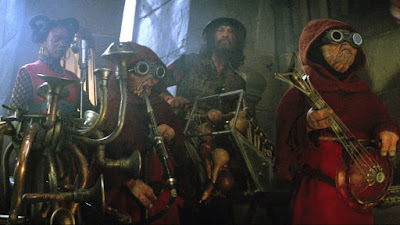 While everyone remember "The Binary Sunset", "Duel of the Fates", and "The Imperial March", we needn't forget the in universe music is pretty great to, from Original Trilogy classics like "The Cantina Band" and "Lapti Nek" (or "Jedi Rocks") to the sequel Trilogy's "Jabba Flow". While a musical number may seem like a strange sidebar in a space fantasy, it's hard not to get caught up in their fun. The film has been compared to a heist meets a western, so it wouldn't seem out of the realm of possibilities that Han, Chewie, Lando, and Daenerys Targaryen might visit a cantina or two. It would be a first though to have the musicians actually playing in a scene, as opposed to acting like their playing music with Lin Manuel Miranda and JJ Abrams dubbed in over them, which has the potential to be really cool. The young Han Solo A Star Wars Story film is slated for a 2018 release date and stars Alden Ehrenreich as Han, Donald Glover as Lando, and Emilia Clarke in an unknown role. The film is directed by Phil Lord and Chris Miller.